It used to be that advertising and editorial were kept separate. Today, brands are burrowing into media content, eroding their own credibility and readers’ trust. Your Facebook feed says: “Recommended for you” and “Sponsored”. Your online magazine says “Paid content”, another in Buzzfeed says “Promoted Content” and lists “12 Backpacking Hacks That Are Vital For Business Trips” in an article paid for by Holiday Inn Express, or lists KFC as “Brand Publisher” for an article, “11 Things All Busy Families Should Make Time For”, including KFC’s popcorn nuggets. You read a powerful series of articles on hunger in America, but it is labelled a “paid programme”, produced by Wall Street Journal’s Custom Studios in collaboration with Mini, and includes such branded wisdom as: “Mini owners are all different. There’s no one person that Mini drivers look like. It’s the same with food insecurity. It’s all walks of life”. From TV product placement to mobile news feeds, brands are burrowing into media content and leaving many of us not only confused about spotting the advertising, but concerned too, as advertisers weaken what attracts them to media in the first place: reader trust and credibility. “Marketing communications must be obviously identifiable as such”; so says the UK code administered by the Advertising Standards Authority. Yet, increasingly, advertising is ‘native’, blending commercial messaging so that it appears like editorial content. As the Interactive Advertising Bureau’s industry guide puts it, native advertising attempts to “deliver paid ads that are so cohesive with page content, assimilated into the design, and consistent with the platform that the viewer simply feels that they belong”. (The prevailing view across communications industries is that branded content is a necessary response to ad evasion, which, when ‘done well’, can also provide targeted and valued content to consumers). It is certainly on the rise. According to PQ Media, content marketing worldwide grew by 13% in 2014 to $26.5 billion. Spending on native advertising in Europe is expected to rise from €5.2 billion in 2015 to €13.2 billion in 2020, when it will represent 52% of display advertising spending, according to Enders Analysis. Branded content covers three main areas. The first is brands’ own content (so-called ‘owned’ media) appearing on marketers’ websites, Instagram, Facebook and YouTube channels – and so on. Next is the ‘native’ distribution of marketers’ paid content: ads integrated into webpages, apps and news feeds on social media. Much of this is programmatic, part of the increasing automation of advertising buying, selling and placement. One way we encounter this is the sponsored stories on publishers’ websites, assembled by content recommendation companies like Outbrain and Taboola. The third kind of branded content is material hosted or made by publishers. The migration of advertising from newspapers to online and mobile is recognised as part of the ‘crisis’ for news media. But what is less well recognised is how this has left news media with even greater dependence on ad finance, just as advertisers, faced with increasing choices online, want ‘more bang for their buck’. That has created the conditions for native advertising: advertising which mimicks editorial content. Branded content on Buzzfeed. Fair use. Branded content is associated with digital communications but there is a much longer history of ad integration, which includes advertorials. I will use a traditional artefact as illustration: an issue of The Guardian’s Saturday magazine published in September 2016 contains five double-page spreads marked “Paid content”, for Jaguar, Nestlé, San Miguel, Greenpeace, and AirBnB. For AirBnB, the premise is a ‘diary’ report on a city break to Paris written by Gemma Briggs who visited with partner Alex and child, Nell. The couple stay in the apartment of a film director who leaves them champagne. Two-year old Nell is “goggled-eyed” at the owner’s colourful artefacts, and doesn’t break any. In her own “diary” she describes the Pompidou centre as “cool” and “awesome” and mentions her “comfy” apartment bed; impressive since the average vocabulary of a two-year old is 240 words. Gemma’s account consists of 23 sentences of which 10 refer directly to the AirBnB apartment. We can’t easily trace the authenticity of these voices. What we say, I think, is that the level of control and construction of the communication marks this as a form of “branded wisdom”, to use Naomi Klein’s evocative phrase from No Logo. It also gets us to the nub of this blurring of editorial and adverting. Are existing regulatory arrangements working? In the classic formulation of mid 20th century American journalism, ‘church and state’ – advertising and editorial – should be kept separate, divided by a firewall. Today, digital-only publishers like Buzzfeed have adopted business models based on integrated native advertising: the firewall that was crumbling and then gleefully torpedoed by some news executives in the late twentieth century, is now an archaeological curiosity for many of these contemporary publishers. The Guardian, like other legacy newspapers, is transitional; its unit, Guardian Labs, quarantines the journalistic labour of producing content that is paid for by marketers, but firewalls are tumbling in an ever more desperate struggle for revenues. The Guardian had a pre-tax loss of £69 million in 2016, cut 260 jobs, and announced it was cutting almost a third of its US workforce. At The Independent, the executive in charge of native advertising said journalists were initially “dragged kicking and screaming”, but that now they see “the value of it”. Journalists were initially “dragged kicking and screaming” but now they see “the value of it”. UK media governance – and audiences – have historically benefitted from a clear demarcation between marketers’ sponsored content and the media’s own editorial content. But as paid-for copy becomes increasingly indistinguishable from independent reporting, are existing regulatory arrangements working? The UK regulator, the Advertising Standards Authority, has been active. It introduced, for instance, new guidance for vloggers’ brand endorsements following several rulings, including one in which a paid promotion for Oreo biscuits by YouTube vloggers failed to clearly identify the content as advertising. In 2015, the Advertising Standards Agency (ASA) ruled that the labelling “in association with Michelin” on an online advertorial for Michelin tyres was “insufficient to identify the content specifically as an ad”. A year later the ASA found Buzzfeed and Henkel in breach for a paid native advertising listicle for Dylon entitled “14 laundry Fails We’ve Experienced”. The ASA ruled there was insufficient identification that this was marketer-controlled content for someone coming to that content via a social media feed. The comparatively lighter regulation in the United States leapt ahead in December 2015, when the Federal Trade Commission (FTC) introduced new guidance on native advertising, calling for clearer identification. The FTC declared that “Promoted by” implies payment by a brand, but fails to communicate editorial control. So, is this revival of regulatory action sufficient? We’d need to deal carefully with each jurisdiction to answer that fully, but I will highlight some key concerns. The strong FTC line on labelling and identification is welcome but there are problems. There is low adherence to rules and strong incentives to evade them. By 2013 nearly three quarters of online publishers in the US offered native advertising based on a business model of payment to publishers when consumers click on native ads. Of the online publishers offering native ads a study found 70% were not compliant with the FTC’s; a more recent study found nearly 40% non-compliant. A more fundamental problem is that FTC is only concerned with consumer deception, not with the impact of sponsored content on the quality and integrity of media channels and communication services. (For instance, the International Public Relations Association says its members should “not engage in practice which tends to corrupt the integrity of any channel of communication”.) Consumer identification is an important objective, but once we are past the hurdle of recognition there is little regulatory counterweight left against advancing ad integration. In the UK there is a lack of industry agreement to produce consistent signposting and the ASA, lobbied hard by publishers as well as marketers, is less prescriptive than the FTC on labelling. Publishers’ information is rarely read and is idiosyncratic, like The Guardian’s divisions between “advertiser content”, “paid content” and “supported by”. It is not surprising, therefore, that audiences are often confused and annoyed, especially when they discover only after viewing content that it was sponsored. The Reuters Institute found that a third of UK adults have felt disappointed or deceived in this way. In the US, even more (43%) have felt duped. There is a palpable risk that power shifts back to those party to the transaction, away from regulators and the public alike. 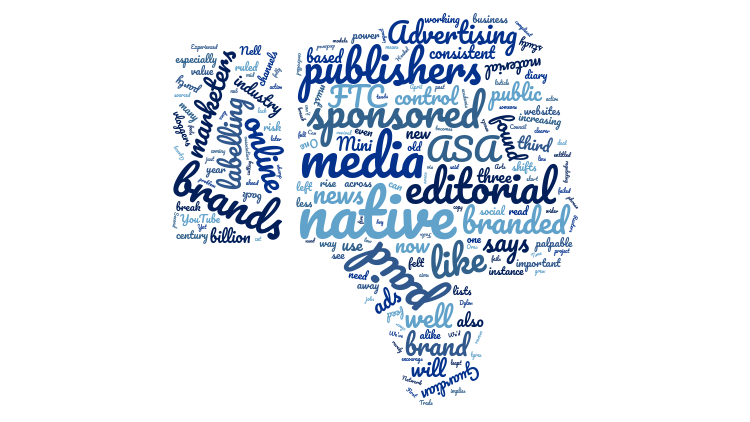 This is especially important because the Committee on Advertising Practice and ASA have recently introduced new guidance defining the conditions by which content funded by brands needs to be identified to consumers. One positive outcome is that the ASA warns against any labelling that disguises advertising or is otherwise unclear to consumers. So, terms like “sponsored by” and “brought to you by” are not permitted where the relevant content is controlled by brands. However, there are three negative outcomes. First there is a diminution in the requirement to identify sponsored content: content supplied or paid for by brands can be published without identification where no control is exercised over editorial content by brands. Can brand sponsored content really also be editorially independent? Second, this means the identification of brand ‘sponsored’ material remains uncertain. Third, for a system that relies heavily on complaints, complaining will now be harder, with complaints based on the possibility that undisclosed brand control might have operated. There is a palpable risk that power shifts back to those party to the transaction, away from regulators and the public alike. All of which is the context for the Branded Content Research Network, a project funded by the Arts and Humanities Research Council (UK), which aims to encourage full exchange and dialogue across academia and industry, as well as wider public debate. We are hosting a public meeting on regulating branded content in the House of Commons at 17:45 on 25 April, as well as further events this year. We need to debate solutions, but consistent labelling whenever any content, including PR sourced material, is influenced by brands might be a start.